There’s no better time than grilling time. I love the season of ‘grill-all-things’ because it makes mealtime SO easy. 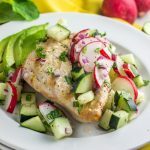 And this grilled chicken with cucumber radish chutney is the perfect paleo dinner made with simple, healthy ingredients. A delicious meal made in minutes. But simple and tasty is THE name of the game in my kitchen, and just one way I survive manage motherhood, career, and healthy living. Sometimes going back to the basics during mealtime is so unbelievably refreshing, it reminds me why I do what I do. Which brings me the most earth shattering PSA ever – HEALTHY MEALS DON’T HAVE TO BE DIFFICULT. And the second PSA of the day – HEALTY MEALS CAN BE REALLY GOOD. Don’t believe me? 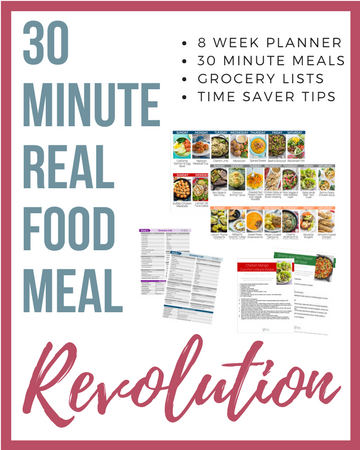 Then you need to get the 30 Minute Real Food Meal Revolution asap. 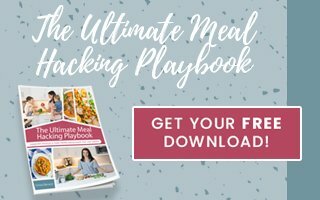 Eight weeks of squeaky clean, family friendly meals in 30 minutes or less. Sorry, now that I got the urge to type in all caps, I feel better now. 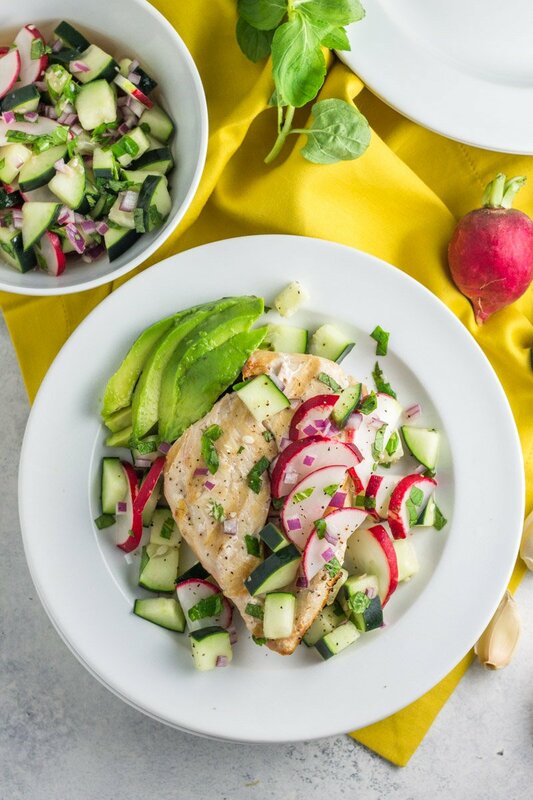 Guarantee you’ll feel better about dinner after you’ve made this grilled chicken with cucumber radish chutney too. It’s one of those late spring/summertime meals you just feel strong and good and healthy after eating. Lean protein with tons of veggies – it just doesn’t get better than that! 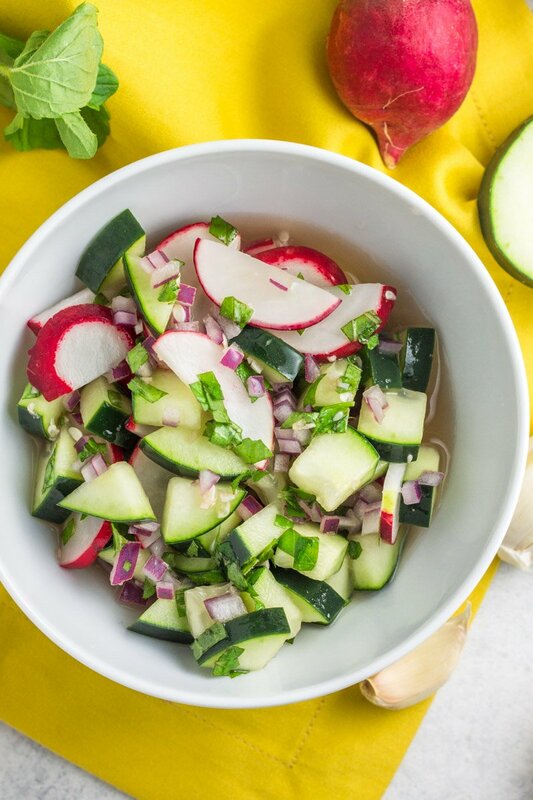 The sweet yet tangy cucumber radish chutney is perfection over grilled meat. This is totally a ‘Chrissa’ kind of meal, so I didn’t even bother trying to serve the chutney to my little guys. However, my 3 year old insisted on trying it (I think those pretty radishes captivated his attention) and to my surprise, he loved it! WHAAA!?!?! Everything about this simple spring and summer dinner has quickly become one of my favorites (and potentially a new love language). YES, it’s tasty and all, but come on – throwing a few chicken breasts on the grill and whipping up this fresh chutney in a matter of minutes is everything. It’s everything. 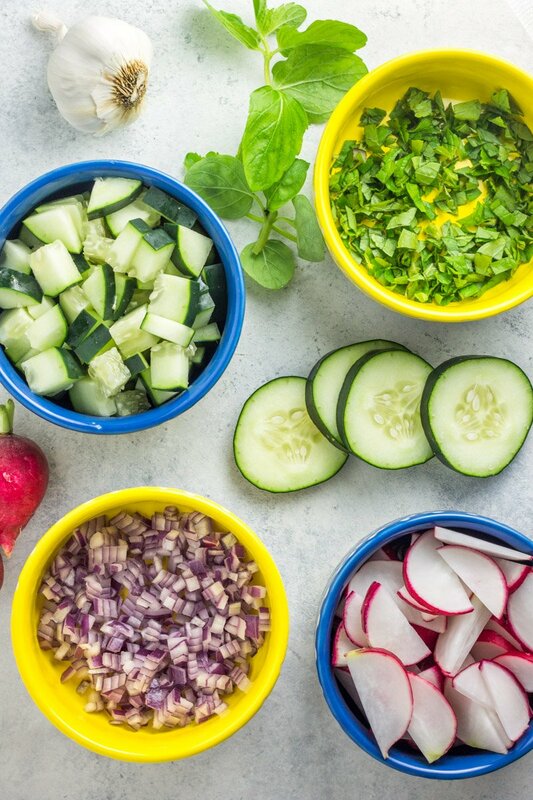 When you’re stuck in a rut for dinner and want to keep things light, clean, and paleo, this grilled chicken with cumber radish chutney is it. You’re kiddos might even surprise you and devour this too. It’s THE healthy dinner of the season. And when you’re ready for something sweet and spicy vs tangy, try this grilled chicken breasts with jalapeño peach salsa recipe! 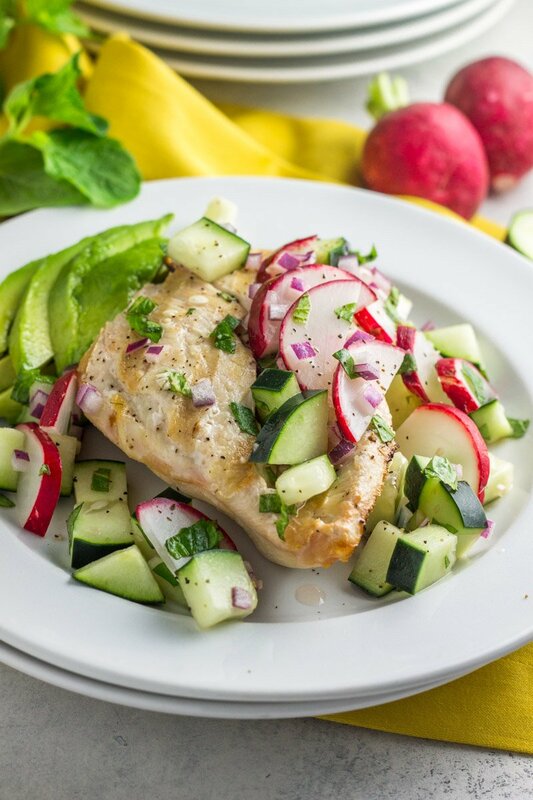 This easy paleo dinner combines fresh vegetables and grilled chicken for big flavor. A healthy, low carb meal in under 30 minutes. This looks like the perfect summer recipe. I can’t wait for it to warm up enough to be able to use the barbeque again! We are all anxious for summer! Enjoy Fiona! Looks good!!! Can you omit the honey or replace with stevia?